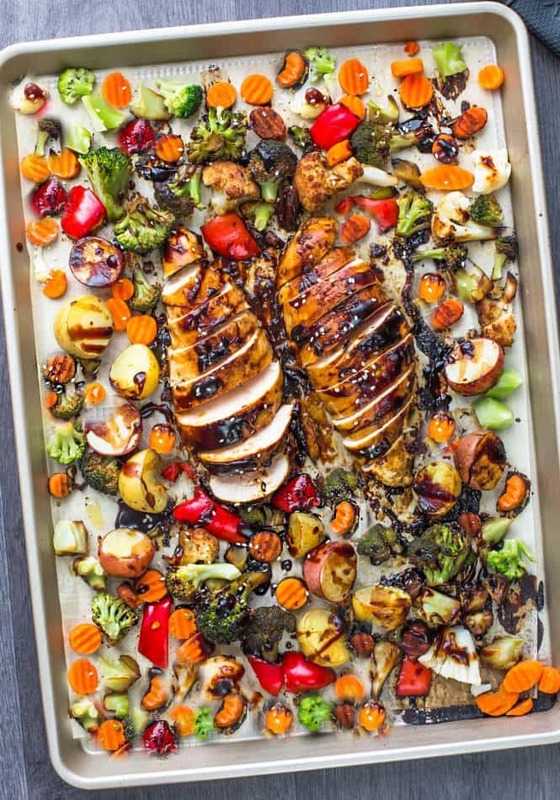 Sheet Pan Hoisin Chicken – an easy one pan meal with healthy roasted veggies. Best of all, clean up is a breeze making this dinner recipe perfect for busy weeknights. Plus step-by-step video. When life gets busy, quick and simple meals rule. 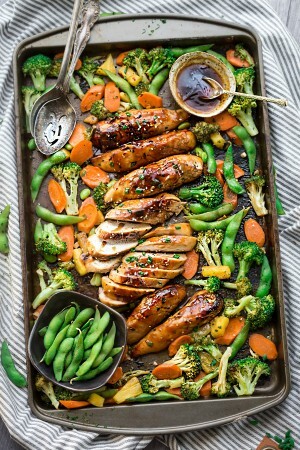 As much as I love a good slow cooker meal — sheet pan meals like this Teriyaki Chicken – are especially perfect on those days when 5 pm rolls around and you don’t have your dinner prep act together. What can be better at that moment than an easy meal with minimal clean up? All you need is your oven and a large baking sheet. Lining it with parchment paper or foil means less mess. The best part is, it’s totally customizable to the veggies you have on hand! Just toss a bunch of what you have in your fridge. 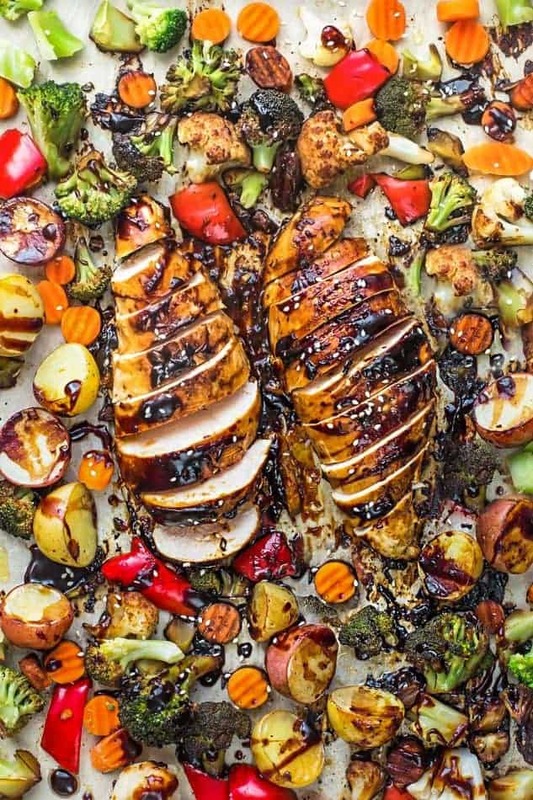 This Sheet Pan Hoisin Chicken and Veggie Dinner is one of our favorites since it’s super simple and full of flavor. 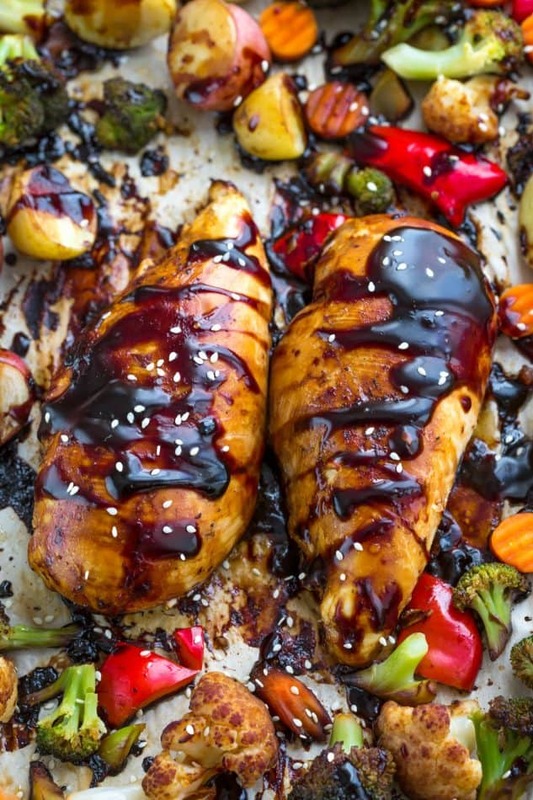 The sweet and tangy Asian-inspired glaze is made with hoisin sauce, soy sauce, honey, sesame oil and some fresh ginger and garlic. The chicken is left whole so it stays tender and juicy while it bakes in the oven. Add it to the pan with potatoes and season with salt, black pepper, olive oil and a drizzle of the hoisin sauce. They cook in the oven for about 15 minutes then the remaining veggies get added to the pan. By adding the broccoli, bell peppers, cauliflower and carrots near the end, it helps the chicken stay nice and tender while the veggies roast up caramelized and crispy. 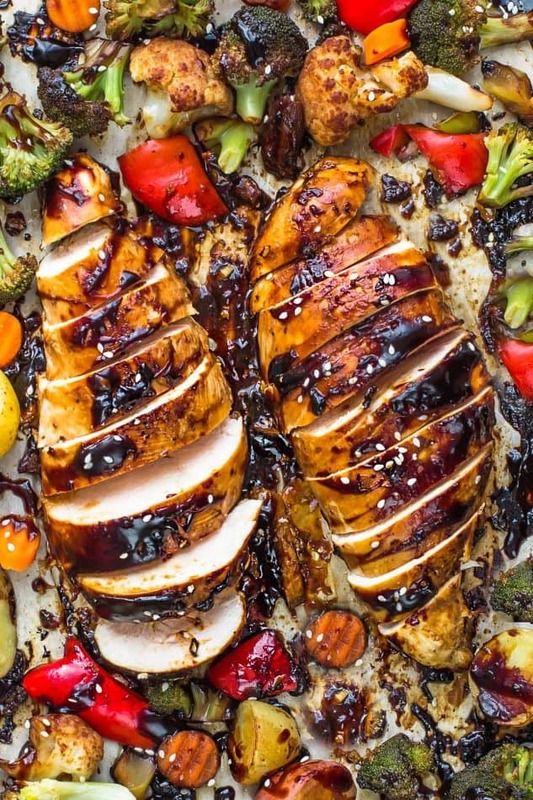 This Sheet Pan Hoisin Chicken makes an easy and simple dinner and leftovers would be awesome for lunches for work the next day. 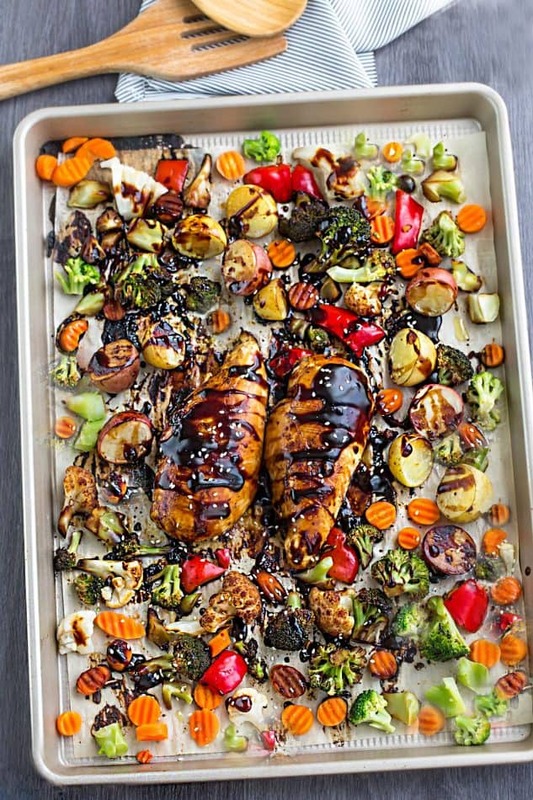 Sheet Pan Hoisin Chicken - an easy one pan meal with healthy roasted veggies. Best of all, clean up is a breeze making this dinner recipe perfect for busy weeknights. Preheat oven to 400°F degrees. 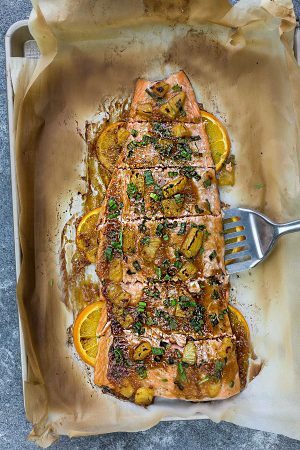 Spray a large nonstick baking pan with oil or use parchment or foil for easy cleanup. In a small bowl, combine soy sauce, hoisin sauce, honey, sesame oil, ginger, garlic and corn starch in a bowl, set aside. Place chicken and spread potatoes in a single layer on the prepared pan. Season chicken on both sides with salt, black pepper and drizzle everything with olive oil and sauce. Toss potatoes to coat well. Bake about 15 minutes and turn chicken and potatoes. Add remaining vegetables and drizzle with olive oil and sauce. Bake for an additional 15-20 minutes (or until chicken is fully cooked through), depending on how thick your chicken pieces are. Drizzle with more sauce and sprinkle on sesame seeds, if desired. Use any other veggies you have on hand! To keep chicken as juicy as possible, bake chicken breasts whole, then cut up (as seen in the image) The chicken might be done before the vegetables, if this is the case, remove the chicken with tongs and bake until vegetables are tender.